As debates over immigration increasingly become flashpoints of political contention in the United States, a variety of advocacy groups, social service organizations, filmmakers, and artists have provided undocumented migrants with the tools and training to document their experiences. 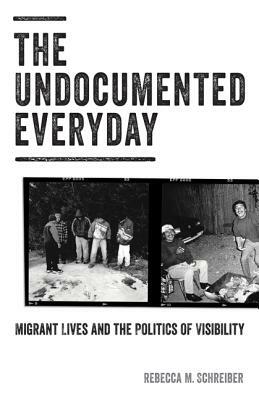 In The Undocumented Everyday, Rebecca M. Schreiber examines the significance of self-representation by undocumented Mexican and Central American migrants, arguing that by centering their own subjectivity and presence through their use of documentary media, these migrants are effectively challenging intensified regimes of state surveillance and liberal strategies that emphasize visibility as a form of empowerment and inclusion. Schreiber explores documentation as both an aesthetic practice based on the visual conventions of social realism and a state-administered means of identification and control. As Schreiber shows, by visualizing new ways of belonging not necessarily defined by citizenship, these migrants are remaking documentary media, combining formal visual strategies with those of amateur photography and performative elements to create a mixed-genre aesthetic. In doing so, they make political claims and create new forms of protection for migrant communities experiencing increased surveillance, detention, and deportation. Rebecca M. Schreiber is associate professor of American studies at the University of New Mexico. She is author of Cold War Exiles in Mexico: U.S. Dissidents and the Culture of Critical Resistance (Minnesota, 2008).